And I choose "Timun Mas" (Golden Cucumber) for this project. The image above is a base treatment for an animated film adaptation of the folktale Timun Mas, literally the “Golden Cucumber”. This story is counted among the most beloved legends from the Central Java folk tradition in Indonesia. A long time ago, there was a woman who had already lived a long time. For her entire life, she had wanted a child, but alas, life does not always give you what you want. In her loneliness and old age, she decided to petition the wild magic of the giants for that which life had denied. Her journey began with a treacherous journey to a magical cave and ended at the feet of a great giant the hue of algae, mold, and jade. There, before the goliath she asked for a child. And joy of joys, her wish was granted, but we are dealing with giants, and with giants there are no gifts—only bargains with many strings attached. The giant promised the gift of child, but not the woman that child would grow up to be. One day, once the child has grown, the giant will take her back and gobble her up for his supper. Desperate for a child, the old woman agreed and in return, the giant gave her a single cucumber seed. In the garden outside her kitchen window she planted the seed. In but a few days that seed had grown into a massive creeping vine with a single golden cucumber, glittering and perfect, at its end. After picking the immense vegetable, she brought it inside and cut it open with as much care as a midwife severing the umbilical. Inside she discovered a lovely baby girl. Holding her daughter for the fist time, she spoke to it softly and gently, “your name is Timun Mas. I am your mother and I love you”. Timun Mas grew fast and well. In time she transformed from a pretty child into a stunning young woman, as striking a change as a yellow flower blossoming into cucumber. As every birthday passed, the time of the giant’s price drew closer, and the old woman’s guilt grew. But Timun Mas knew only of the joys that her life brought and nothing of the terrible events soon to come. On the evening before of her seventeenth birthday, Timun Mas’s mother came to her with tear-stained eyes and a heart filled with regret, and remorse, and shame. The time had come to tell her daughter the terrible truth. The love shared between Timun Mas and her mother was strong. Knowing the price of her life and the life she had before her child, the old woman had given all the love she was capable of to Timun Mas, and Timun Mas, knowing only this complete love, reflected it back. Once Timun Mas had been told the story of her conception and conscription, there was fear. Of course there was fear, but also forgiveness. That night, Timun Mas’s mother prayed to God with as much determination as she had so many years before for a baby. She prayed for absolution and for the life of her child. Hearing her prayer, God sent a wise old man to aid her in this time of need. He appeared from nowhere and departed in kind. The only evidence of his visit was a group of four small pouches left behind. One held cucumber seeds, the next needles, the third fine grains of salt, and the final, terasi*. The next morning Timun Mas’s awoke to find her hair had turned a shimmering gold over night. So enamored was she with the newly glowing locks, that she almost did not hear her mother enter the room. There in the pail glow of morning Timun Mas was given the four packets as a birthday gift. No sooner had the gift been given, than the ground began to tremble, the trees began to part, and the air became heavy with the thick musk—exactly the smell of things forgotten but still longed for. Moments later, the giant was upon them to clam his price. There was no time for thought, no time for goodbyes, no time for anything but to run, to run from her mother, her home and the life she had know. Timun Mas’s feet took her as fast and far they could, put each lumbering step from the giant was worth 50 of her own. In desperation, Timun Mas turned back and threw the first pouch at the brute. It ineffectually struck his shin and fell to the ground. This small act of defiance brought laughter to the giant and as his dark chuckles shook mountains, a single seed fell free of the pouch. The moment it touched the fertile soil, a cucumber shoot erupted from the ground. The plant crept and wrapped around the giant, vines as thick as ropes; the base as dense as a beringin tree**. As the tangles grew more and more, the giant’s laughter quickly turned to fear and Timun Mas’s flight shifted swiftly to attack. Held tight by the gargantuan cucumber plant, the giant writhed, just as the vines began to snap and break, Timun Mas threw the second packet. A small number of needles landed on the cucumber plant and sunk into its flesh. Moments later, thorns began to bubble and blister out of the vines, tearing into the giant’s skin wherever the two met. The gargantuan screamed and thrashed, but only managed to entangle himself further as small torrents of sapphire blood began to flow from the fresh wounds. The giant begged for mercy, but knowing that kindness would never be retuned, Timun Mas threw the third pouch. The salt mixed with the pools of blood collecting on the jungle floor and began to fizz and grow. The blood became salt water, and the water rose quickly until it was a vast ocean, stinging each wound on the giant’s torn skin. The giant was reduced to a screaming, gnashing mass. Anger and fear incarnate. Timun Mas poured the final packet into the sea. The terasi mixed with the liquid, and the water was no longer water, but quicksand made of spice and stinging heat, and the giant slowly sunk into it, where he was doomed to spend an eternity falling, drowning, and burning. Timun Mas waited for the final few bubbles to slowly rise to the surface of the mud pool that had become the evil thing’s grave before she turned around and began the long walk home. * Terasi – A spicy fermented shrimp past used in traditional Indonesian cuisine. ** Beringin – Indonesian term for banyan trees. 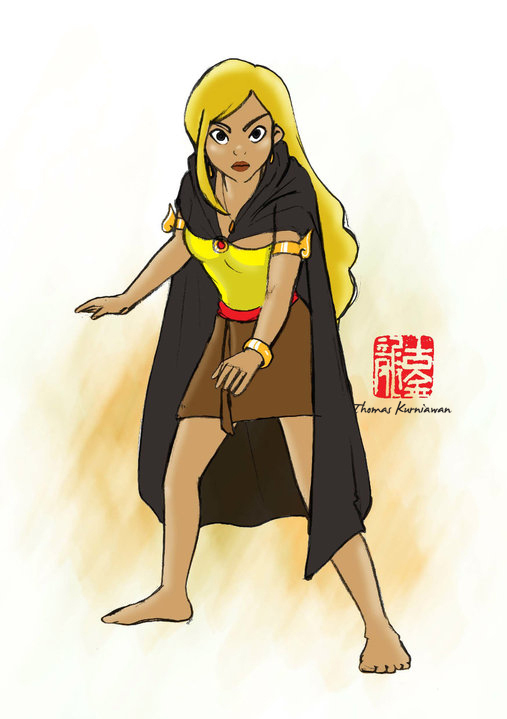 In my plan, I changed some parts of the original story of Timun Mas... like her hair turns to golden hair when she's 17th birthday. this is great! keep up the good work dude! Oh wow, you're very talented. Glad to see someone's still appreciating Indo folklore! Mas Thomas.. Gimana kalau buat versi Indonesia dari Disney princess iu? women heroes Indonesia siapa yah? Saras 008? Awesome pieces of work. Keep it up and good luck for doing this amazing project. Indonesia must support you!!! I find a picture of it looks like Jessica Alba ! Disney should really take this one up! That's pretty impressive. Good work. this is really good. i love timun mas.and i love your drawings and animation. 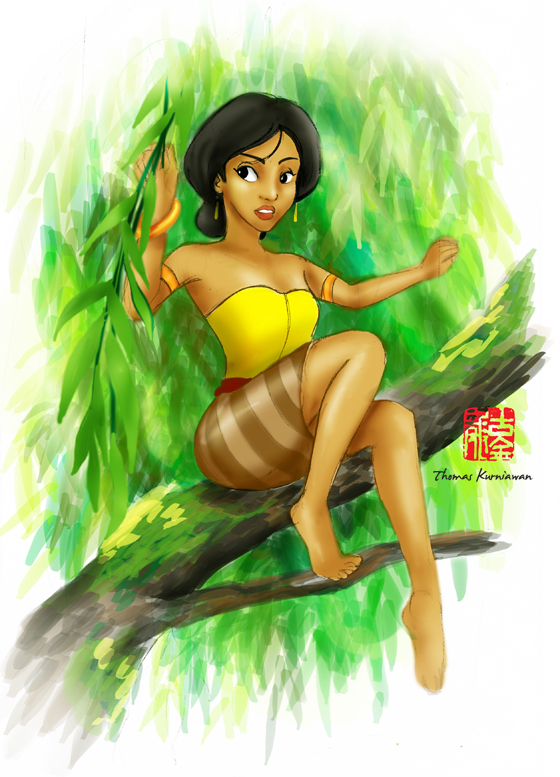 though technically timun mas was not a princess just as mulan and pocahontas were not princesses. but pocahontas was a chief's daughter so i guess it counts as princess and as for mulan, i dont know, she's a hero i supposed she's more important than a princess. Timun Mas wasnt a princess. and basically the story is about a woman who cheat on her promise. I think she looks better with dark hair than with blonde hair. I like the Dark hair better than the blonde hair. There are enough blonde princesses. 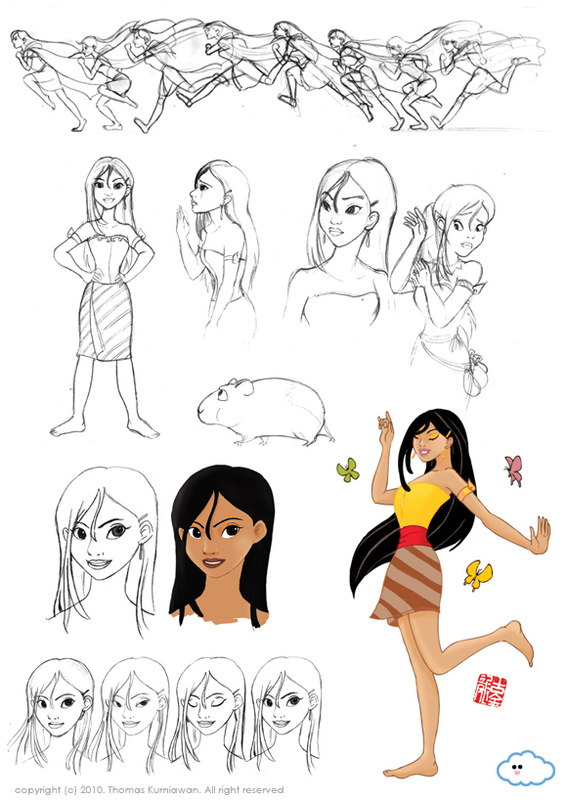 Timun Mas will make a lovely upcoming Disney Princess. Keep a good work bro! I'm love your arts! They're awesome.. 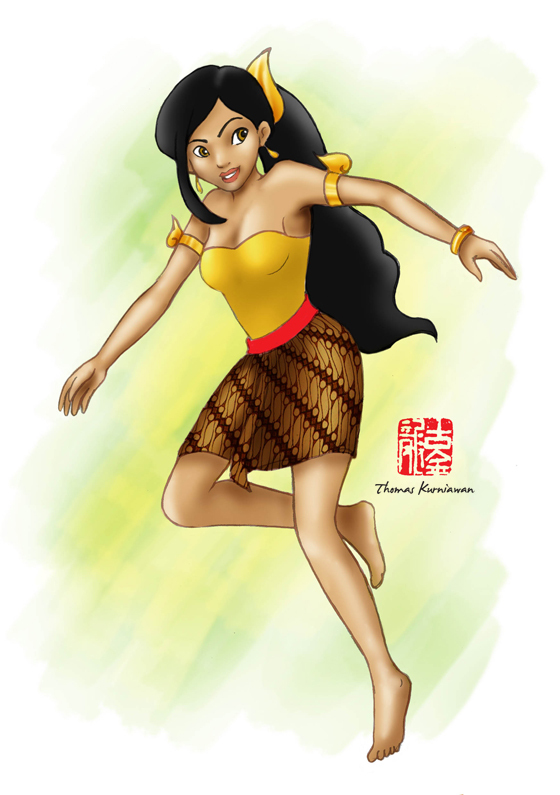 I appreciate this, same as you, sometimes I hope disney would make movie about Indonesian princess. I really sure that Indonesian kebaya is prettier to than a gown. Wish that happen. I appreciate that. You see, Indonesia has a lot of folktales, and has lots pretty kebaya. Sometimes I wish that Disney would make one someday. My suggestion, you should change the hair into black cause it more prettier, and make the skirt longer. Keren mas Thomas. Sebagai penggemar film Hollywood, terutama Disney kayanya sayang banget mas kalo ga di film-kan. Coba search gitu mas orang2 yang kerja di Disney, trus tawarin deh ceritanya. Sumpah mas, bakalan bagus. Campuran Pocahontas + Brave keren banget pasti. Good job, mas Thomas!!! COba Kang bikin film Animasi dari cerita Indonesia. Anak2 sekarang kegerus ama sinetron dewasa doank kang.